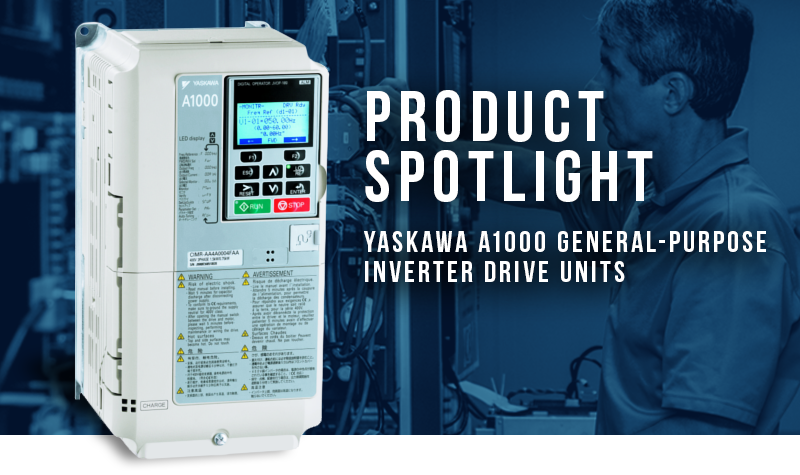 This month, we are highlighting the Yaskawa A1000 series of general purpose inverters. Yaskawa is a proven industry leader when it comes to general purpose inverter units. Billed as the single drive for all your needs, the A1000 drive is a truly versatile and efficient unit. The A1000 allows for network communications, feedback via closed-loop vector control mode and an expandable I/O. Available in 200V, 400V and 600V input capacities, this series of drives has a wide range of output capacities. Ranging from 0.75kW – 110kW, 0.75kW – 630kW, and 1.5kW – 185kW for each voltage input, respectively, the A1000 series can be used in a wide range of applications. In a compact and narrow package, the A1000 series drives can easily replace larger, less efficient inverters with the benefit of a reduced footprint. Standard I/O for these inverters includes 24V (DC) multi-function digital I/O, multi-function 0 – 10VDC analog I/O, and pulse I/O which can be expanded via a removable terminal board. With the ability to run in open or closed loop vector control, the A1000 offers outstanding regulation and position control capability. Either an absolute or incremental encoder can be used for feedback. A comprehensive list of parameters allows for extensive user control over the setup and performance of the A1000 series inverters. Controlling everything from multi-function I/O to specific energy savings functions is possible through keypad operation or by network communication. Using Yaskawa’s DriveWizard software, users can easily access parameters and drive information directly on their computer. This allows for ease of use in programming and adjusting performance parameters. The included digital operator is accessible from the cover of the drive and is useful for troubleshooting and checking drive status. Some common alarms are described below. Often times mistakenly identified as an alarm, “bb” indicates a base-block state. When in this state, output is interrupted while control power still allows access to parameters and alarm readout. Upon clearing any machine issues and applying a “ready” signal to the unit, the A1000 will enter a ready mode and allow for running the output motor. “CALL” is a serial communication transmission error and can indicate a mis-wiring or connection issue. If all boards are connected properly and power cycling does not clear the issue, there may be damage to the control section of the drive, requiring repair. “OH” is an overheat and points to an issue with the drive’s temperature. If the internal cooling fan stops working or the airflow around the drive is restricted, this alarm may be triggered. Properly cooling the drive or cleaning the heat sink can typically remedy this issue. “PGO” shows a feedback issue. This can be caused by a wiring issue between the drive and the feedback unit or a damaged encoder unit. If a short circuit damages anything on the encoder, the drive will display PGO as a protective measure. The A100 is a versatile drive and is a great option for CNC applications, pumps, fans and many other industrial settings. For more information on the A1000 series or for inquiry on drive repair, please call us today!